For many of you, this Monday marks the last week of work before the holidays. We will have two more updates but they will not have a lead article by me — it is the holidays after all! The next time I write it will be to wish you a happy new 2015! But before we go there, I want to just reflect a bit on 2014! As the year comes to a close, I hope you reflect on just how much has been accomplished by you, your district, your staff, and your students! CASE, too, has accomplished much! In 2014 we had a very successful 3rd Annual Hybrid Conference in Orlando, Florida, which was packed full of great information. We had a phenomenal joint member/board of directors meeting in Philadelphia in conjunction with the CEC convention in April. If you missed the amazing CASE Night at the Phillies ballpark, you missed a great night of collegial networking, fun, food and great baseball! The 12th annual CASE educational legislative leadership conference with CASE members representing 28 states visiting over 150 distinct congressional offices was a huge success! We added two new state affiliates — Wyoming and Texas! We had all but two (2) of our state and provincial units attend our fall board of directors meeting. The rich, intentional discussions held during the two days are being used by our various CASE committees to formulate additional action and reactions! Our 25th annual fall conference held in San Antonio was also a big success. CASE has also been very involved with our state and provincial units throughout 2014 through keynotes and breakout sessions by me as your executive director. CASE executive committee members have participated in partnership events with NAME, NASDSE, CEC, NCLD, NASP, AASA and other national organizations. CASE truly IS your voice and we have been "very loud" in 2014! Now is not the time to stop though it may be a good time to take a deep breath! 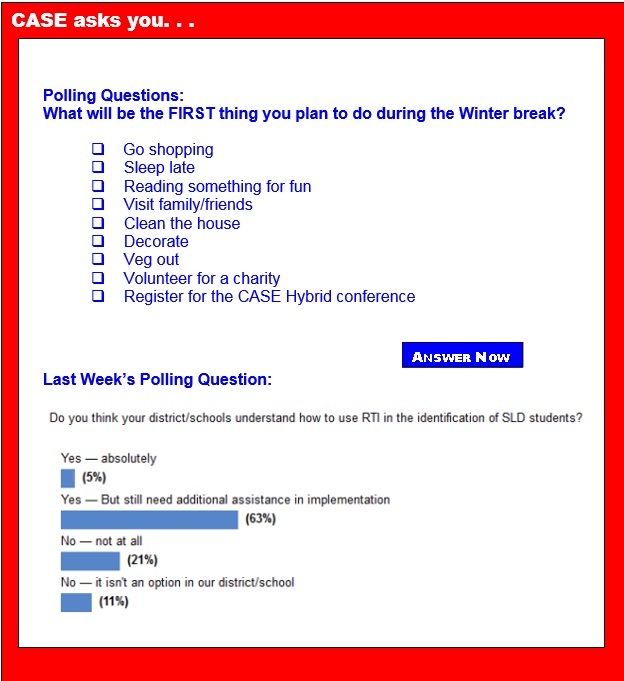 Speaking of Your Voice ... Last week's poll asked, "Do you think your district/school understands how to use RTI in the identification of SLD?" Only 5 percent said an unequivocal yes! Of those answering the poll, 11 percent said no and it isn't an option and another 21 percent said no, not at all! The largest group (63 percent) of those answering said yes, but additional professional development is needed! Have we got a deal for you! CASE partnered with the National Center for Learning Disabilities, National Association of State Directors of Special Education (NASDSE), and the National Association of School Psychologists (NASP) to do a national roundtable in NY October of 2013. The CASE representatives were then president, Laurie VanderPloeg (MI) and Policy chair, Phyllis Wolfram (MO). After work, re-work, and work again, the toolkit is live and a great resource for our schools and districts! The flyer and of course the website has all the content and the worksheet! If you missed the live webinar of the RTI Toolkit you can listen to the recording by clicking here! The webinar features the organizations involved in this partnership in a panel discussion. Panelist include Dr. Steve Kukic as moderator, Drs. Jim Wendorf (NCLD), Bill East (NASDES), Luann Purcell (CASE), Susan Gorin (NASP) as well as Candace Cortiella (The Advocacy Institute). Be sure you take advantage of this great TOOLKIT! Watch for the next quarterly In CASE Newsletter before you head off for the holidays! 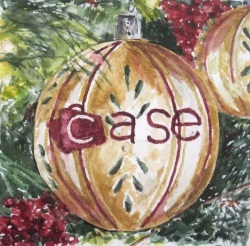 The Winter edition of the In CASE newsletter should arrive in your email box by Friday, Dec. 19. Watch for this chocked full of great information issue! If you miss the email, you can always retrieve the latest issue behind the MEMBERS ONLY section of the CASE website. Remember, to log in use your MEMBERS ONLY log in from the CEC website! Give you and your staff a great gift this year and start 2015 off in a collaborative and productive way! Signed up to be a virtual site for the 4th Annual CASE Hybrid conference and start working on getting the "right" people in the room to learn all about legal issues/updates and results driven accountability! The conference will be held on Feb. 19-20 and there will be a significant amount of discussion on how partnerships can make RDA and our legal issues work to the benefit of our students and staff! Click here for the flyer on the conference — remember you have two options: travel to the wonderfully WARM Phoenix AZ or be the host site for a virtual conference — same low price — and for just an additional $50 you can have the DVD of the complete conference to use over and over and over! For more information and to register, click here. Click here for Hints for Virtual Sites and click here to register. PS ... Have you liked CASE on Facebook? Do you TWEET? Follow CASE @casecec. From the CASE Office, we hope you and yours have a very Happy Holiday season, full of family, friends, fun, and good service to others! U.S. Secretary of Education Arne Duncan and Health and Human Services Secretary Sylvia Burwell announced that 18 states have been awarded grants, totaling more than $226 million, under the Preschool Development Grants program. The U.S. Department of Education's Office for Civil Rights and Office of Special Education and Rehabilitative Services, together with the U.S. Department of Justice's Civil Rights Division, issued joint guidance about the rights of public elementary and secondary students with hearing, vision, or speech disabilities to effective communication. Secretary Arne Duncan and U.S. Attorney General Eric H. Holder announced the release of a Correctional Education Guidance Package to help states and local agencies aimed at helping states and local agencies strengthen the quality of education services provided to America's estimated 60,000 young people in confinement every day. Rep. John Kline, R-Minn., was selected by his colleagues to serve as chairman of the House Education and the Workforce Committee in the 114th Congress and issued a statement with the start of this new role. Should teachers know a child takes ADHD meds? Jonathan Moore's class notes look a little different from the rest of his peers. He doesn't like using bullet points, numbering or flow charts. Instead, the 14-year-old seventh grader gets creative, sketching a picture of how lessons unfold before him. Sometimes, the teacher and blackboard with lesson are all included. In a recent class about the Declaration of Independence, he drew a partial metal skull, bloodshot eye and declaration all on one page. Jonathan says he got an A on the test on that material. There is often a long and winding road to reading success for students with learning disabilities. Competent teachers of reading know and understand the five components of reading, why each needs to be explicitly addressed in instruction in a systematic and sequential manner, and how to provide these types of instruction while both encouraging and monitoring a student's progress. In addition, instruction needs to be ongoing and scheduled frequently enough to foster learning. In the dimly lit room, Tiara Santos lounged on the beanbag chair, stared at the bubble tubes and played with glow-in-the-dark toys, and then slowly, the demeanor of the girl with autism began to transform. "Before we came in here, she was hard to control," said Tiara's teacher, Danielle Galambos, about the 12-year-old. "Here, she feels safe. She is quieter, more relaxed." Tiara was in a sensory room at the Felician School for Exceptional Children in Lodi, N.J., which was designed to stimulate neglected physiology in students with disabilities. In Tiara's case, it brought on a smile, as well as some calm. What does Congress's budget squabble mean for education? If you've been paying attention to Congress this week, you've probably noticed lawmakers feverishly trying to come to an agreement about how to avert a government shut-down, which could occur Dec. 11 when the current stop-gap measure that's financing the U.S. Department of Education is set to expire. Readers of Politics K-12 know this fiscal scramble all too well. Because of across-the-aisle and intraparty bickering, it's been years since Congress funded the government under the normal appropriations process by passing 12 separate agency funding bills. And this year proved no different. Bridgewater-Raritan, New Jersey, school district puts 80,000 audiobooks in the hands of struggling students. Poor testing, difficulty sustaining attention, confused by letters, numbers and words ... Dyslexia. It's one of a host of reading disabilities one in every five students face each day as they go to class. Now, more than 500 students across all 11 schools in the Bridgewater-Raritan school district — through a partnership with Princeton based national nonprofit Learning Ally — have access to a tool that is changing the game for these struggling readers. Can the act of making or designing something help kids feel like they have agency over the objects and systems in their lives? That's the main question a group of researchers at Project Zero, a research group out of the Harvard Graduate School of Education, are tackling alongside classroom-based teachers in Oakland, California. In an evolving process, researchers are testing out activities they've designed to help students to look more closely, explain more deeply and take on opportunities to change things they see around them. According to a new survey, 50 percent of mothers of daughters diagnosed with Attention-Deficit/Hyperactivity Disorder thought their child's behavior was part of "normal" adolescent development and struggles before they eventually sought help. The nationally representative survey of 1,883 people was conducted by Edelman Berland and fielded by Harris Interactive. Researchers looked at tween girls with ADHD ages 8 to 14, as well as mothers, adult women with ADHD, teachers and healthcare professionals, in order to examine the awareness around girls with ADHD. Although often starting in the elementary grades, homework becomes more seriously given and seriously taken in middle school, when early adolescents start having a lot of other growing concerns on their minds and generally become less welcoming of bringing study obligations home. At an age when there is more resistance to work, more school work is assigned. Listening. Sharing. Following directions. Making friends. Managing big emotions. Planning for the future. A high-quality preschool program helps children develop in all these ways. But, a new report argues, such matters of the heart shouldn't be left behind just as students are learning to tie their shoes. Melissa Tooley and Laura Bornfreund of the New America Foundation write that schools should focus on these same skills, habits, attitudes, and mindsets with older kids. They say research shows they're just as important as academics. A therapist goes to middle school and tries to sit still and focus. She can't. Neither can the kids. Angela Hanscom, a contributor for The Washington Post, writes: "Except for brief periods of getting up and switching classrooms, I've been sitting for the past 90 excruciating minutes. I look down at my leg and notice it is bouncing. Great, I think to myself, now I'm fidgeting! I'm doing anything I can to pay attention — even contorting my body into awkward positions to keep from daydreaming. It is useless, I checked out about forty-five minutes ago. I'm no longer registering anything the teacher is saying. I look around the room to see how the children a few decades younger than me are doing."